Thanks to everyone who responded to my request for comments about the blog and its future. It’s very gratifying to have received such positive feedback and to know that my work is appreciated. With that in mind, the comments and emails have convinced me that I shouldn’t make any major changes, even if it would have been wiser to have deliberated more before posting and amending the recent post about a possible sighting. Apologies to those who were unable to view this post due to the temporary password protection while it was being reviewed. As mentioned previously, we currently have six cameras aimed at potential feeding trees. Tommy Michot will be deploying the seventh (on the tree discussed below) in the near future. This will put us at or near what I consider full capacity in terms of servicing the cameras and reviewing the imagery. Since Frank’s death, the task of reviewing images and working with the cameras had fallen almost entirely on Phil Vanbergen’s shoulders, and we’ve only changed cards when there’s been evidence of woodpecker activity on the target tree but have otherwise allowed them to overwrite. Recently, several people have volunteered to review the imagery, and Tommy and I have gotten a better handle on deploying the cameras. Thus, we’ll be able to shift to replacing the cards every few months and (hopefully) reviewing all the images we capture. 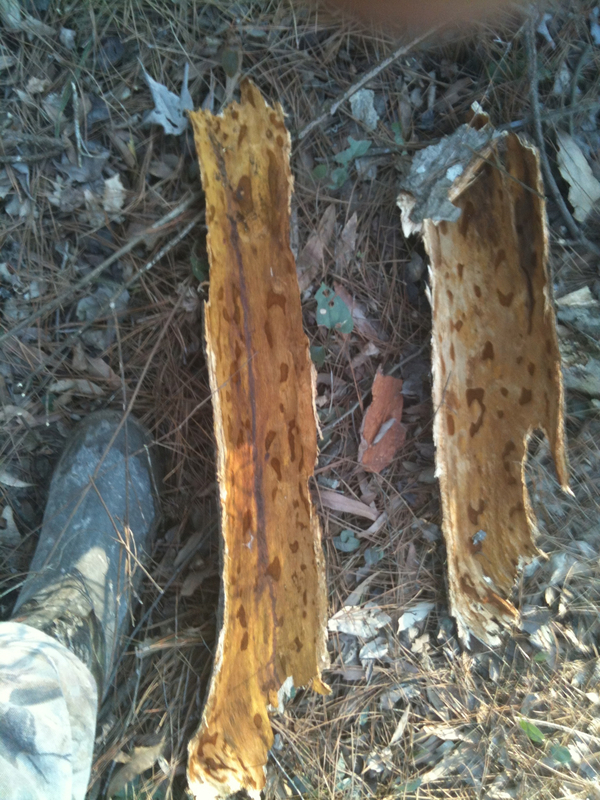 On the last trip, Tommy and I found recent bark scaling on a sweet gum stub, and although the bark was loose, we decided to move one of our cameras and target the stub. The camera had previously been aimed at a hickory that lost its top in a storm last year, a location where Peggy, Phil, Tommy, and I heard a double knock last year. For some reason, the overwrite function failed, so the card was full when Tommy and I redeployed the camera. I brought it home to review. I found some interesting imagery that I’ll share and discuss. I think that at least one of the frames is suggestive of ivorybill, although it is far from conclusive, and no one I’ve shared it with is nearly as interested by it as I am. Regardless, I’m now convinced it’s a good idea to check every card and am very glad that Geoffrey McMullan encouraged this approach. First a few comments on trail cams, which will update some of Frank’s observations from this post on the subject written in January 2015. Our trail cams are made by Day 6 Outdoors. The Plot Watcher Pro is the only dedicated time-lapse mass market trail camera. It’s lightweight, easy to use, and inexpensive compared to Reconyx, the second best time-lapse option. The accompanying software makes it possible to step through the captures frame by frame or to view them as video at various speeds. (Our time lapse interval is 20 seconds.) This simplifies the reviewing process, at some cost to image quality, although this has always been a problem with trail cams. Trail cam sensors are relatively low resolution; only in the last year or so have 20 megapixel cams gone on the market, and many brands are in the 10-12 MP range. The bigger problem is that these cameras are designed to photograph terrestrial creatures, mostly large mammals and Wild Turkeys. It’s also almost impossible to avoid backlighting over the course of an entire day. Thus, unless the subject is at fairly close range, the chances of getting an identifiable image are greatly reduced, as will become clear from the examples below. So let’s look at some of the captures. I used Let’s Enhance, an internet based, automated image enhancement program. The card ran from January 24 – May 1, and I worked my way backwards. During that time, there was one clearly identifiable woodpecker capture – a PIWO that spent under 40 seconds on the target hickory. Note that WordPress has changed the way photographs are presented, at least in the format I’m using. To enlarge the images in this section, click on the image, and it will appear in a separate frame. There’s an option to see the full-sized image at the lower right. You can further enlarge the full-sized images by using the cursor. The first large woodpecker capture was on March 16. The bird, which is not clearly identifiable, was present from ~3:25-3:46 pm, though it was not visible in all frames. I’ve included a QuickTime video covering the entire period (and about 10 additional minutes), along with a few enhanced screen caps with a box around the bird, which first appears on the right fork of the beech tree to the left of the target, then flies to a high branch in the background and moves around before disappearing. The next series that interested me is from the morning of March 9. A bird in flight is visible in one frame captured at 8:22 am. It appears near the beginning of this 50 frame QuickTime animation. This is an enhanced JPEG of the relevant frame with a box around the object of interest. While others disagree, I think the object in the box is the upper (dorsal) surface of a bird’s wing. (One reviewer suggested it could be a squirrel’s tail.) There is nothing to suggest the bird in question is a woodpecker (if it’s a bird at all, which it appears to be based on the time lapse). To my eyes, however, it has a pattern of black and white that is consistent with the wing of an ivorybill, if the white is on the trailing edge. Given the distance from the camera and the extent of the white on the wing, I’m confident it is not a Red-headed Woodpecker. I’m also confident that this is actually an object, based on a review of the surrounding frames and on experimenting with color, exposure, and white balance. I’ve included a few examples, in a tiled mosaic to illustrate. Again, click on the individual images to embiggen. A third frame that I found somewhat less interesting was captured on the morning of February 16th. I’m less intrigued by this image. 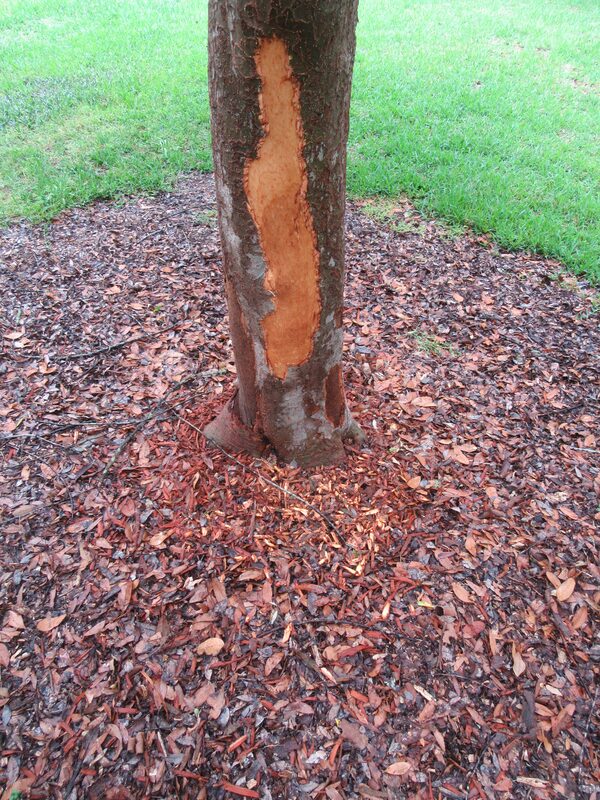 It has been suggested that it might show a Pileated Woodpecker wing or a Red-headed Woodpecker on the target tree. I’m not sure what’s going on, but I think it may show a woodpecker with a lot of white on one of the smaller trees behind and to the right of the target (which would make it too large to be a Red-headed Woodpecker). I suspect that the bright patch of white on the bird is an artifact, since it matches some of the highly reflective leaves below and to the right. Regardless of whether any of these captures involves an Ivory-billed Woodpecker and despite the problems with image quality (which I hope are even more apparent to readers of this post), the images highlight the importance of reviewing all cards and having as many cameras functioning as is possible. I’m hopeful that this more extensive coverage, which is at or near the maximum that’s practical for us, will be productive in the future and may solve the mystery of what’s doing the initial scaling on the hickories. But as I noted recently, this will require patience, and it may take a few years. Don’t Know What This Is. A Sedge? Perhaps a Nutsedge? Cottonmouth. I Didn’t See Many Snakes This Trip. Tommy Saw Several More.